London Winter Wonderland Christmas spectacular, Hyde Park. A spectacular ice & snow sculpture experience! Follow the magical pathways and admire the beauty of the exquisite sculptures and crystal-like characters throughout the themed rooms. Meet the woodland ice creatures as you roam through the stalagmite forest – the ice bears, wolves, stags, owls, foxes and rabbits. Try a seat in the fairy tale unicorn-pulled carriage and take the slide in the magnificent ice castle. Specially created by Winter Wonderland and unique to the UK, this arctic experience will take your breath away! SANTA’S FACTORY IN SANTA LAND! Children and adults alike will be enchanted by our unmissable addition to Santa Land this year. Introducing: Santa’s Factory – a fun-house where Santa and his industrious elves are making gifts ready for the big day! Walk through his magical sleigh, meet the elves and pay a visit to Santa’s Lapland grotto. If you’re good with heights and want to see Winter Wonderland from above try the fabulous new Star Flyer. For a truly exhilarating experience, soar over 60 metres into the air as it spins 360 degrees and feel the wind through your hair. It’s the closest thing to flying! This beautiful carousel takes the traditional festive ride to a new level – literally! Featuring two glittering decks of unusual and fantastical animals for you to ride – choose from a sea dragon, eagle, reindeer, sea horse, tiger, elephant and many more! In addition to the popular Angels Market – over 100 charming wooden chalets selling a wide array of unique and handmade gifts – this year sees the introduction of a second market area. The Yuletide Market gives you an even bigger Christmas shopping experience, including traditional yuletide gifts, jewellery, winter wear, wooden toys and Christmas decorations. Winter Wonderland is the UK’s biggest Christmas attraction, taking place each Christmas at Hyde Park and becoming one of London’s great festive traditions. The attraction is open from 10:00am to 10:00pm. Winter Wonderland features numerous seasonal attractions including The Magical Ice Rink, the Giant Observation Wheel, the Room on the Broom stage show, and fantastic circus shows performed inside a heated big top tent. 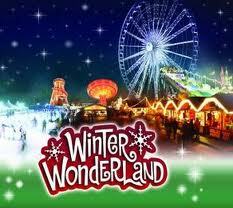 Entry to Winter Wonderland is free, with charges for some of the attractions. Entrance to see Santa is free. Posted on November 5, 2012, in christmas markets, Christmas Tours, Discount London, London at Christmas, London for kids, Sightseeing Tours, Visit London, winter wonderland. Bookmark the permalink. Leave a comment.